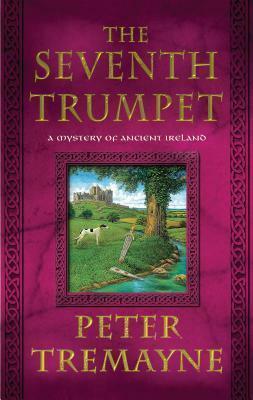 When a murdered corpse of an unknown young noble is discovered, Fidelma of Cashel is brought in to investigate, in Peter Tremayne's "The Seventh Trumpet"Ireland, AD 670. When the body of a murdered young noble is discovered not far from Cashel, the King calls upon his sister, Fidelma, and her companion Eadulf to investigate. Fidelma, in addition to being the sister of the king, is a dailaigh an advocate of the Brehon Law Courts and has a particular talent for resolving the thorniest of mysteries. But this time, Fidelma and Eadulf have very little to work with the only clue to the noble's identity is an emblem originating from the nearby kingdom of Laign. Could the murder be somehow related to the wave of violence erupting in the western lands of the kingdom? The turmoil there is being stirred up by an unknown fanatical figure who claims to have been summoned by "the seventh angel" to remove the "impure of faith." Fidelma and Eadulf, once again grappling with a tangled skein of murder and intrigue, must somehow learn what connects the dead noble, a murdered alcoholic priest, and an abbot who has turned his monastery into a military fortress. When it appears that things cannot get more complex, Fidelma herself is abducted, and Eadulf must rescue her before the mystery can be solved." "Tremayne writes so authentically about this remote time period that readers will feel they are there in every way . . . a delight!" --"Library Journal" (starred) on "Master of Souls"
"The action is tense and gripping . . . a compelling, enjoyable adventure." --"The Philadelphia Inquirer" on "The Monk who Vanished"
"Tremayne, a master of the medieval mystery, continues to shine." --"Booklist" on "The Dove of Death"
"Fidelma's ability to best opponents, whether in argument, strategy, or audacity, makes her a heroine for any age." --"Publishers Weekly" on "The Council of the Cursed"
PETER TREMAYNE is a pseudonym of Peter Berresford Ellis, a renowned scholar who has written extensively on the ancient Celts and the Irish. As Tremayne, he is best known for his stories and novels featuring Fidelma of Cashel. He lives in London.